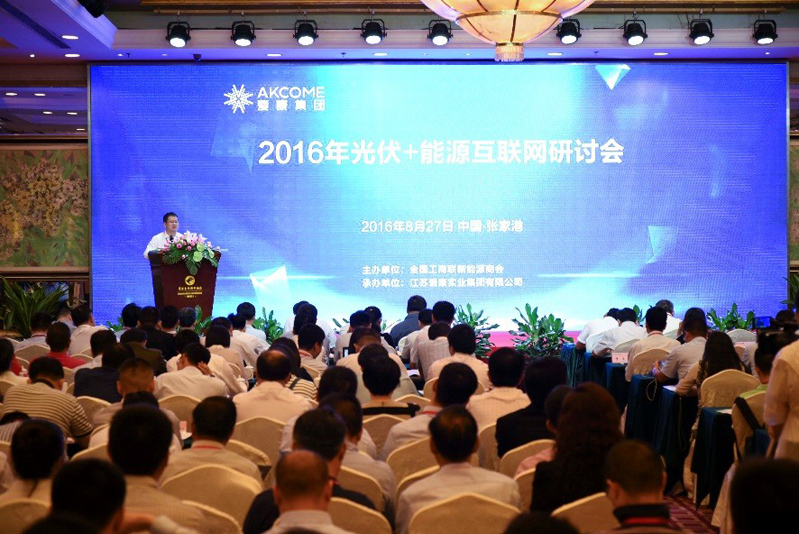 On the 10th anniversary of the Akcome’s foundation on Aug. 27, the 2016 PV + Internet of Energy Seminar and the 10th Anniversary of Akcome’s Foundation was successfully held in Zhangjiagang to promote the combined and innovative development of PV and Internet of Energy industries. Sponsored by the New Energy Chamber of Commerce of the All-China Federation of Industry and Commerce, organized by the Akcome Group and supported by the International Energy Institute of the National Development and Reform Commission, the PV + Internet of Energy Seminar was attended by leaders from associated ministers, and experts and scholars from relevant scientific research institutes and industrial associations, who shared their opinions and suggestions in a hope to jointly promote the in-depth combination and multiple development of the PV plus Internet of Energy industry. Akcome’s plan to deploy in the new “Trend” of Internet of Energy and its innovative efforts to create the new mode of “Energy + Internet + Finance” were uniformly “Liked” among the industrial experts. As the organizer, Akcome Group is one of the leading companies in the new energy industry of China. For the past decade, Akcome Group has transformed from a PV aluminum products manufacturer of single product structure to the first listed PV accessory manufacturer for A shares, from a PV accessory manufacturer to an integrated operator of PV power station, and currently in a strategic swift from a power station operator to an integrated energy service provider. Zou Chenghui explained that the investment under the new trend should focus on the energy service and financial service. The energy services include the making of PV products, PV power station solutions, charging piles, new energy automobiles, energy storage system and power sales business. Meanwhile, the group set up the Shanghai Financial Control and Management Center to make available all financial links to minimize the cost for the whole industrial chain. “Akcome Group's strategic deployment is so far-reaching.” On the seminar, Zeng Shaojun, vice president and secretary general of the New Energy Chamber of Commerce of the All-China Federation of Industry and Commerce, said that since ground power stations are scattered farther away, Akcome Group provides a perfect solution to deal with such ensuing issues for the entire PV solar industry as the construction, operation, service and overall improvement of performance, representing the development direction of the industry. On the night, Akcome Group held the 10th anniversary ceremony in the Sports Center of Zhangjiagang, when Rene Liu and Guo Feng sang songs to show their wishes to the group and Akcome employees staged wonderful performances to celebrate the 10th anniversary of the group’s foundation. Besides, the Akcome Charitable Foundation was set up on the night. While maintaining a considerable pace in development, Akcome Group will make greater contributions to the charitable career as usual.